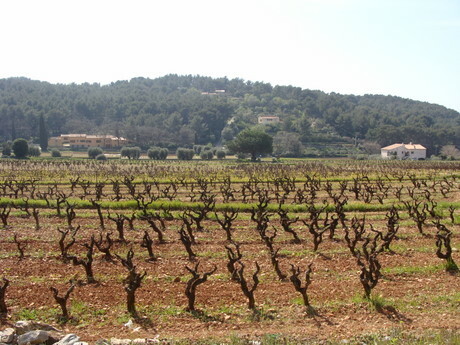 In the far south east of France lies what many consider the most serious wine of Provence. There lies the Mourvedre-heavy, multi-layered, and dense Bandol. My first full-frontal showdown with Bandol was in 1998. It was love at first sight. It’s no surprise given my intense hanky-panky with Cornas and Hermitage at the time. I consider both serious epicurean camarades to Bandol. Typically blended with Grenache, Cinsaut, Syrah, and Carignan, but made up of at least 50% Mourvedre, Bandol is an unique bird. Usually overshadowed by the comparatively pricey local roses, this little resort town wine from the Mediterranean is home to where Mourvedre can actually ripen into thick-skinned and gamey yumminess. Although California and Australia (Mataro) produce Mourvedre, France and Spain (Monastrell) are where it succeeds and actually has character. Though, Bandol is the true gamey-Haven. Bandol can be the perfect complement to food or a sincere conversation companion. The important part is that the true ‘change-your-life’ nourishment comes from inside the bottle! Unfortunately, few producers are available in the United States. The easiest to find are Domaine Tempier and Bastide Blanche. I’d keep your eye out for Pradeaux, La Rouviere, and occasionally Domaine de Fregate. Tifanie Reid (Cork & Demon) recently let me try a blind sample of the ‘04 Woodrose Winery Cigale and I was impressed and re-ignited with the hope for a brighter future for Texas wines. Previously, there had truly only been four wines that sparked anything, the ‘99 Alamosa Guapo (I think it was ‘99, anyway), the ‘00 Alamosa Syrah, the ‘00 Alamosa Palette, & the ‘03 Lone Oaks Merlot. Tifanie led me on a Texas High Plains pep-rally tour and now I’m ready for the crawl. A few days later, I hit a few wineries in the area, on my way to Woodrose. —Welcome to Texas. Have you been had, I mean helped? —45 Merlot,37 Sangiovese,18 Cab Sauv/cherry vanilla wafers..hmmm. Two varietals that carry a might for exploration! More and more South American wineries are popping them out of their closets. Bonarda & Carmenere. Roaming the land of Argentina and Chile. Many believe Bonarda was brought over from Italy by 19th and 20th century immigrants. Along with Criolla (Mission) and Malbec, it is the most widely planted grape in Argentina. But alas, there are those who believe that Argentinean Bonarda is actually a California grape called Charbono…which some experts believe is a strain of the Italian Piemontese grape Dolcetto! Carmenere once vied with Cabernet Sauvignon for quality in France’s Bordeaux region. But when the root louse phylloxera swept through France’s vineyards in the late 1800s, Carmenere didn’t take well to grafted rootstock and was thought lost to history. Before phylloxera, some supposedly Merlot vines from Bordeaux were planted in Chile. At least, it was thought to be Merlot. More than a century later in 1994, it was discovered that much of Chile’s Merlot actually was Carmenere, and now other areas of the New World are discovering it. These varietals are waxing cult dreams. Hop in the yumdom wine wagon and go. ‘03 La Posta Bonarda Estela Armando $14 A +2 **. .. in Chile with a 2003 Casa Julia Carmenere $10 A- +4 **. Beaujolais is made from the Gamay grape, in the southern part of Burgundy, where Pinot Noir reigns as King. Using Carbonic Maceration, a way to make light red wines without many tannins, the Beaujolais Nouveau is made to drink quickly (not known to age well). The ‘Nouveau’ phenomenon began in the local bars, cafes, and bistros of Beaujolais and Lyons. Upon release every Fall, in pitchers filled from the growers’ barrels, Beaujolais Nouveau was received with enormous enthusiasm. Due to strong success, the government stepped into regulate sales. In 1938, regulations and restrictions were put in place. In 1951, these regulations were revoked and the Beaujolais Nouveau was officially recognized. By this time, what was just a local tradition had gained so much popularity that the news of it reached Paris. The race was born. It wasn’t long thereafter that the word spilled out of France and around the world. In 1985, the release date was changed from November 15 to the third Thursday of November (French Law) tying it to a weekend and making the celebration complete. But wherever the new Beaujolais went, importers had to agree not to sell it before midnight on the third Thursday of November. Due to the way it is made (the must is pressed early after only three days), the phenolic compounds and astringent tannins normally found in red wines aren’t there, leaving an easy to drink, fruity wine. This, coupled with the fact that it tastes best when chilled, makes for a festive wine to be gulped rather than sipped, enjoyed in high spirits rather than critiqued. As a side note, it makes a great transitional wine for anyone wanting to move from white to red wines. On a more technical note, the wine is strictly speaking, more properly termed Beaujolais Primeur. By French and European rules, a wine released during the period between its harvest and a date in the following spring, is termed primeur. A wine released during the period between its own and the following years harvest, is termed nouveau. Mostly due to the efforts of the Dubœuf negociant in the region… in the last 45 years, sales have risen from around a million bottles to more than 70 million bottles. On a side note, and in order to see what Beaujolais is capable of (and Gamay for that matter), there are 10 villages in Beaujolais that produce the best and most expensive wines. Three that might surprise the inexperienced that consider Beaujolais strictly ‘light and boring’ are Moulin-a-Vent, Morgon, and Fleurie. These granite-laden hills have a history of making wines with structure, body, and finesse. A brilliant secret and contrast to the much more known and lighter Beaujolais appellation. Temperature: In general, white wines should be served chilled and red wine at room temperature. For whites, a couple of hours in the fridge will do just fine. If you're pushed for time, then put the bottle in an ice bucket filled half with ice and half with cold water. This will bring the wine down to the desired temperature in about twenty minutes. For most reds, room temperature is ideal, unless the room is a balmy 80°F, of course. We've all had warm red wine served to us in restaurants and, frankly, it does the wine no favors. Light, fruity reds, like Beaujolais, are best served a little cool, especially on a warm summer day. Champagne, dessert wine, most sherry and rosé should be treated as white. Red port should be served at room temperature but tawny port can be chilled. Decanting: This is the process of pouring off any sediment that has been deposited in the bottle over time to create 'clean wine'. It is frequently done with vintage port or older red wines that have spent many years in a bottle. The vast majority of wines do not need to be decanted at all, but if you do need to do it, simply pour the wine slowly into a glass decanter or jug keeping an eye on the neck of the bottle. When you see sediment in the neck, it's time to stop. 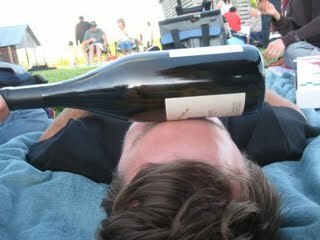 Decanting can also help the wine "breathe". Breathing: If a wine has spent many years locked up in a bottle, away from the air, it will benefit from a little breathing time. This can take place in the glass or in a decanter and twenty to thirty minutes should suffice. Even young wines can benefit from a little breathing time as it allows the wine to open up and really show what it's made of. You can test this by tasting a wine immediately after opening it and then see how your second glass tastes some twenty minutes later. There's often quite a difference. That's also why, if you're opening several reds, open them all at once. You give your next bottle a chance to breathe, while you are enjoying the current one. On the other hand, whites generally don't need to be opened ahead of time, as the goal is usually to retain their freshness. Glassware: The best glasses for appreciating wine are made of plain, thin, clear glass. Heavy, cut glass makes it difficult to see the wine properly. The glass should have a wide bowl tapering to a narrow opening; a tulip shape, in other words. This allows room for the wine to be swirled in the glass while concentrating the aromas at the rim. Champagne should be served in tall flutes or tall, thin tulip-shaped glasses. Today there are many specialty glasses designed to be used with different grape varieties. While these may, indeed, enhance the attributes of the different wines, they really aren't necessary. A good, all purpose glass like Riedel's "Ouverture" series red and white wine glass, is a simple, elegant solution for about $7/glass. Fill level: The glass should never be filled more than about half full. This allows room for swirling the wine around in the glass to release its aromas without splashing it all over the table. A good way to achieve this is to leave the glass on the table, hold the stem at the base and make small, quick circles with the base. Try it! If you don't finish the bottle, most wines will keep quite happily for a couple of days with the cork stuck back in the bottle, keeping the air out. You can even buy vacuum pumps in wine shops to remove the air altogether, which will buy you another day or two. Whites are better off in the fridge and reds left out at room temperature. It's impossible to say exactly how long a wine will keep once open because each wine is different, but in general the higher quality the wine, the longer it will keep.